The actress didn’t see what happened, but about 45 minutes later, one of those three guys came running out and needed a set medic. Apparently they had inserted something inside the girl and things were bad. The medic came and the ambulance came. The parents of the girl were told some crap story. That crap story ended up killing the girl because the parents believed the executives. Two weeks later, the show finished shooting six episodes all at once and then everyone was sent on their way forever. No one wanted the kids around or any witnesses to what happened. This entry was posted in Children, conspiracy, crime, Culture War, Evil, Hollywood liberals, Liberals/Democrats/Left, Pedogate, pedophiles, sexual perversities, United States and tagged Crazy Days and Nights, Ent Lawyer, Heather O'Rourke, Hollywood pedophiles, Poltergeist, Steven Spielberg. Bookmark the permalink. Pedophiles should be shot… slowly, starting at the feet, then inch by inch, moving up, one shot per day. Or maybe skinned alive. Or put in a slow, very slow, meat grinder, feet first. Or all of the above at the same time. Still not enough. Wow! Poor Heather!! My heart cries for her. RIP Heather. It looks like parents were too trustworthy with their children. What perverts – trust but verify. Is Heather making some kind of symbol with her hands in the picture? I can’t tell, but her hands look funny. That IS some kind of “message”,but my left hand can’t turn far enough to duplicate it. It almost looks like some form of “target” on her belly,or an almond shaped port….There’s SOMETHING there…. As disgusting as it can get, Satan at work. Wow. I’m speechless. What is there to say? Prayers to all of those who have been and are being affected by humans who have given into their evil. This poor child. And these sickos are probably still walking around doing what they do. Their sentence should be putting their overused pecker into a shredder and left unusable forever and then their hands removed so they may never pleasure themselves again. Why can’t Ent Lawyer get the names of the adults who were present? I can’t believe it is just my imagination the picture of little Heather and spielberg, at the top of the ‘post’ appears to me as a clear and vivid comparison of innocence and souless evil. The look in spielberg’s eyes should send shivers down the spine of any parent. No hoorays for Hellywood, the opposite is due for much of it. A major element of popular culture being served by many to destroy our nation. The photo at the top of this article, reminds me of this photo …..
What gets me is the doctors hiding the truth about her cause of death. Spielberg produces nothing but weird films, but then he is weird. Many years ago I heard of the casting couch. I have to think the parents have known of it. Everyone has heard of the casting couch. 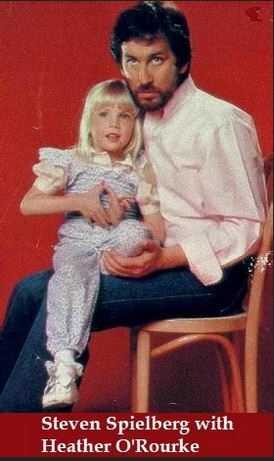 the picture of spielberg with little Heather is very disturbing…especially with the illuminati red background….spielberg exudes poison from every pore. the picture looks like he is trying to hold her hostage in hell. I know the Lord protects the little children, her death was her release from these evil people. First thing that comes to mind always is the parents, where were they? in all news media. Instead we have virtual silence.